I may be a Minnesota Vikings fan and looking forward to seeing how the team performs today against the Washington Redskins with Teddy Bridgewater standing on the field for the first time in 15 months, albeit in a backup role…for the moment. But truth be told, I am more interested in the moves that can be made to continue the growth and development of the 2018 New York Yankees. I’ve spelled it both ways but I guess I’ll go with Otani moving forward. I continue to see it spelled either way and I don’t have Ohtani/Otani on speed-dial to clarify. The Associated Press reported that Shohei Otani held a news conference on Saturday. Otani’s words included, “The other day I met with team officials and stated my intentions. My request was met with warm words of support, so I hope to do my best in America from next year on.” While it would be financially wiser to wait until he turns 25 to enter Major League Baseball (when he could be a free agent with no restrictions), Otani wants to raise the level of his game now rather than wait. “I am not a complete player yet, and I want to go to an environment where I can continue to get better”. 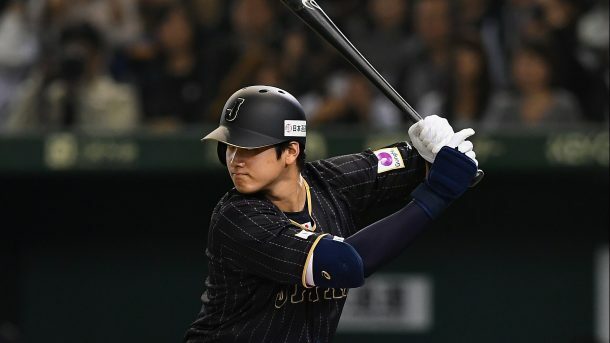 Otani apparently had a desire to go to MLB straight from high school but instead opted to sign with the Nippon-Ham Fighters with assurances that he could play a two-way role for the team. While he would like to continue hitting and pitching, it sounds like he is a realist and wants to see what situations are available to him in the United States. “Just before I turned professional, I didn’t imagine I would be able to do both, but since then, the fans have encouraged it,” Otani said. “That has left me with a strong desire to keep doing it…not only for me, but for them.” The DH role seems to tilt the scales in favor of the American League and the big market endorsement opportunities ($$$$) seem to favor the Yankees. The Yankees remain the frontrunners but until he is formally posted and signs a contract with a MLB team, it’s anybody’s guess where he’ll ultimately end up. I hope he is a Yankee and that the presence of Hideki Matsui and Masahiro Tanaka in the organization are deemed as huge positives for him. Nick Cafardo of the Boston Globe cites the Toronto Blue Jays as a possible dark horse destination for Otani but, seriously, the Blue Jays do not bring the honor and prestige of MLB’s most-storied franchise. My off-season goal remains to see the headline, “Yankees to sign Otani”, followed closely by “Yankees trade Ellsbury”…. The second name on GM Brian Cashman’s interview list was the former Indians and Mariners manager. Ummm, next please. I do not want to see the former backup Red Sox catcher as Manager of Baseball’s greatest franchise. 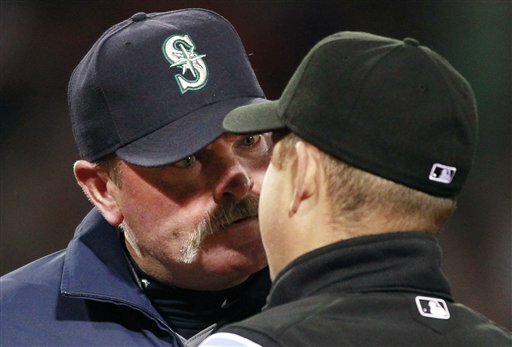 I don’t buy the ‘third time’s a charm’ logic for the two-time managerial loser. This name reinforces to me that I want someone with connections to either the Yankees or to the city of New York and its surrounding region as the next skipper. Aaron Boone is another name receiving much attention and he’ll most likely be included on the interview list in the not-so-distant future. With the GM Meetings on tap for this week, starting Monday, it will be interesting to see if Cashman is able to continue with the interview process or if he has to take a brief pause. The big name agents will be present at the meetings to begin dialogue for potential signings leading up to next month’s Winter Meetings. So even though there probably won’t be any significant trades or signings this week, the groundwork is being laid. Perhaps Cashman spends just a day or so at the GM Meetings before excusing himself and leaving his chief lieutenants to represent the Yankees. I don’t know the Yankees time frame, but I am hopeful they resolve the managerial search by Thanksgiving so the team knows its leadership as we head into the very busy and vital December trading/signing period. 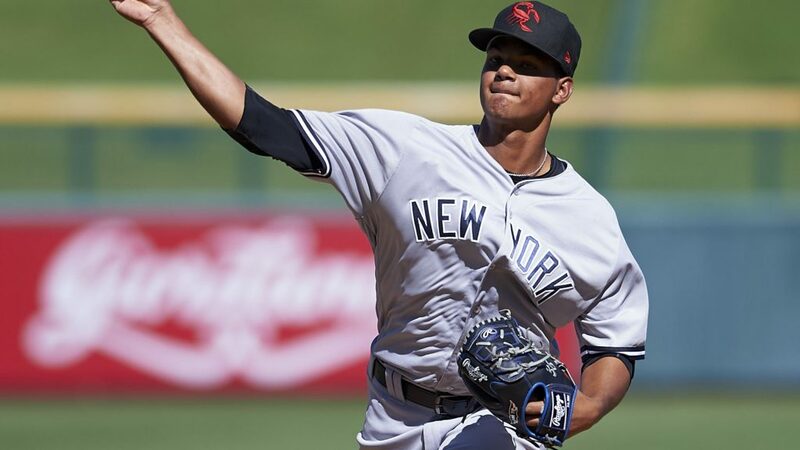 I personally like Yankees prospect Albert Abreu, the young 22-year-old right-hander acquired from the Houston Astros in the Brian McCann trade, as one of my favorites in the farm system. But scouts seem mixed regarding whether he is the next Luis Severino or is deemed to be a more valuable component to add to the bullpen mix. Of course, it was only last off-season the same question was being asked about Severino. 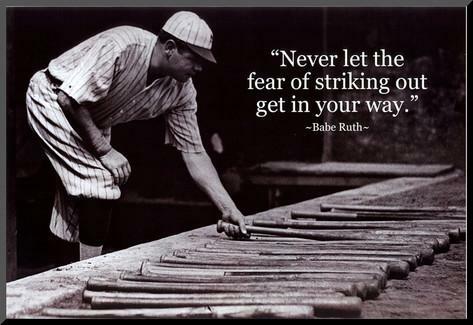 I prefer to see Abreu start, but opportunity will play a major role. If the Yankees sign Otani, the Yankees rotation seems fairly solidified with Otani, Severino, Masahiro Tanaka, Sonny Gray and Jordan Montgomery. That’s already considering young arms like Chance Adams and Justus Sheffield (plus Domingo Acevedo) are waiting in the wings. But I can never think of a season off the top of my head where a team’s sixth or seventh starter didn’t play a key role at some point in the season. Abreu must take advantage of any opportunities that he is given. He’s one of the arms that I’ll be paying close attention to next Spring. 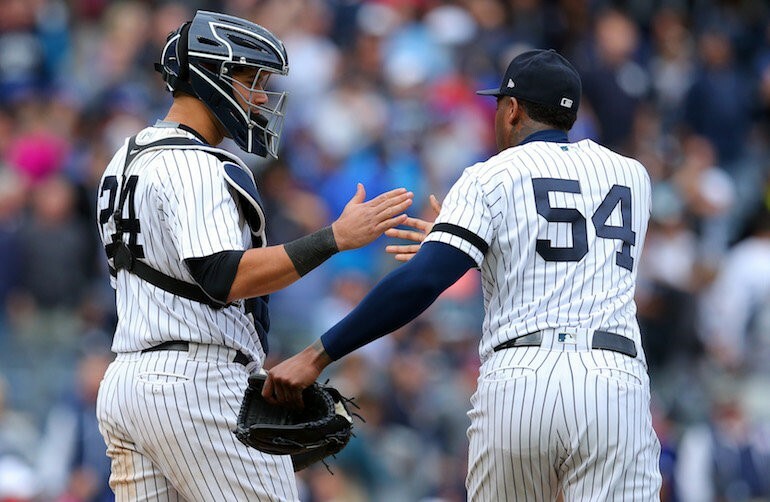 Brian McCann may have picked up a World Series ring, making his acquisition a huge win for the Astros, but the Yankees did very well picking up Abreu and RHP Jorge Guzman for the former Yankees catcher. I’ve seen a number of pro-Astros articles that claim a huge Astros victory for the trade, but in time, I think the Astros and their fans will rue the day they let Abreu and Guzman go. I know that it’s been written on this site that the Yankees should go after Miami Marlins slugger Giancarlo Stanton, but it’s not going to happen on Hal Steinbrenner’s watch. With the team committed to getting under the payroll cap to reset luxury tax penalties, I don’t see the Yankees parting with the young prospects that it would take to acquire Stanton or committing the necessary dollars to take on Baseball’s largest contract. Yes, Yankee fans can dream but it is not going to happen for the Pinstriped faithful. So, where does Stanton go? There is talk that early conversations are being held with the Boston Red Sox. 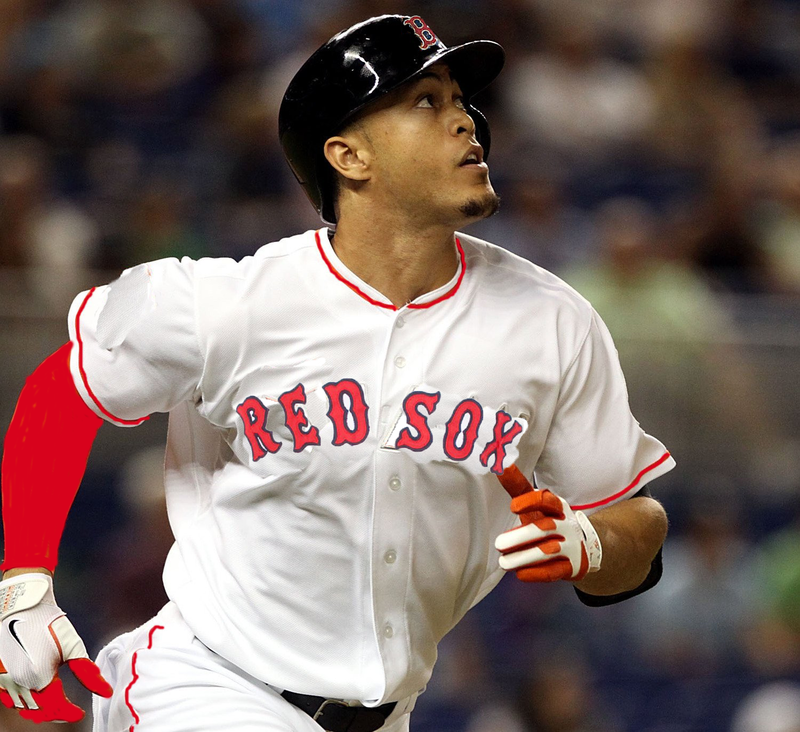 I fully expect the Red Sox to add a big bat this off-season but I’d be surprised if they went after Stanton. It’s scary to think of Stanton in that lineup, but the Red Sox will need big dollars for their young, cheap talent like Mookie Betts and Chris Sale. Betts made just $950,000 last year and is now arbitration-eligible. The Red Sox have Sale for two more years and will need lock him up on a long-term deal to avoid losing him through free agency. Those are two guys who will command a healthy chunk of Red Sox payroll over the next few years. I think it is more likely the Red Sox pursue someone like free agents first baseman Eric Hosmer or outfielder J.D. Martinez to help fill the void when David Ortiz retired after the 2016 season. Nevertheless, it’s within the realm of possibility for Boston to get “greedy”. After all, Sox owner John Henry has to feed the beast, otherwise known as the Red Sox Nation. Another team mentioned for Stanton is the St Louis Cardinals. I don’t see the Cardinals ponying up the cash to take on Stanton’s contract, let alone the prospects that it would take. While it now looks like a very prudent financial decision, they let their franchise player, Albert Pujols, one of the all-time Cardinal greats, depart through free agency a few years ago over money. The other two teams mentioned as possible destinations are the San Francisco Giants and the Philadelphia Phillies. It will be interesting to see how this develops over the course of the off-season even if we are forced to be bystanders as Team Hal looks at the bigger picture and of course the bottom line. Well, let’s see what this week brings. Go Yankees! Sabathia locked into a pitching battle with Toronto’s Marcus Stroman for the first few innings. 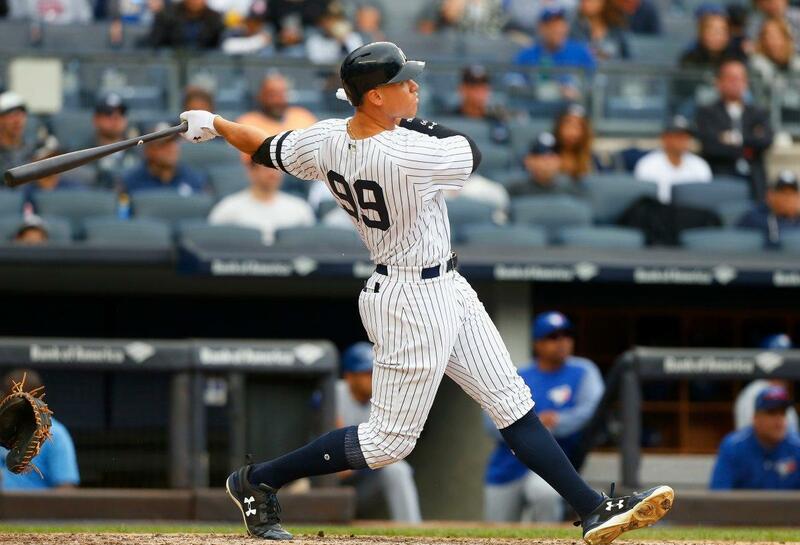 The game was scoreless until the bottom of the 4th when Aaron Judge belted a monster blast over the left field seats (484 feet) for his 52nd home run of the year. All Rise! But the Yankees weren’t finished. Didi Gregorius hit a one-out single to left, a ball that nearly grazed the top of the glove of Blue Jays shortstop Ryan Goins. 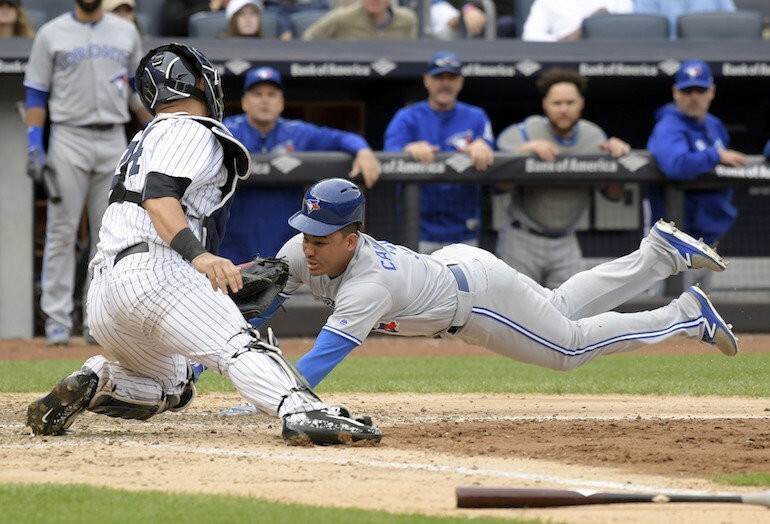 While Starlin Castro was taking his hacks at Stroman, a wild pitch got away from catcher Russell Martin (a bouncer through his legs) allowing Didi to advance to second. With the count full, Castro singled to center, past a diving Ryan Goins who barely got a piece of his glove on the ball, to score Gregorius. The Yankees were up, 2-0. The Blue Jays changed pitchers for the bottom of the 5th with reliever Aaron Loup replacing Stroman. Loup walked two of the first three batters he faced (the two Aarons) to put Hicks in scoring position, but the Blue Jays pulled Loup and inserted Carlos Ramirez who shut down Gary Sanchez and Didi Gregorius on a strikeout and fly out, respectively. The top of the 6th brought a little drama and memories of the Jeffrey Maier incident years ago the then 12-year-old reached out to catch Derek Jeter’s fly in Game 1 of the 1996 ALCS and Jeter was awarded a home run. With one out, Ryan Goins got a hold of a Sabathia pitch and sent it high to right. Momentarily, it appeared to be a home run but replayed showed a young fan reaching out to catch the ball. The play was reviewed but the call on the field (ground-rule double due to fan interference) was upheld. Goins took second and the fan was shown the exit. Sabathia struck out Teoscar Hernandez for the second out but with Josh Donaldson on deck, CC’s day was done. Chad Green came into the game and got Donaldson to hit a fly to left for the final out. 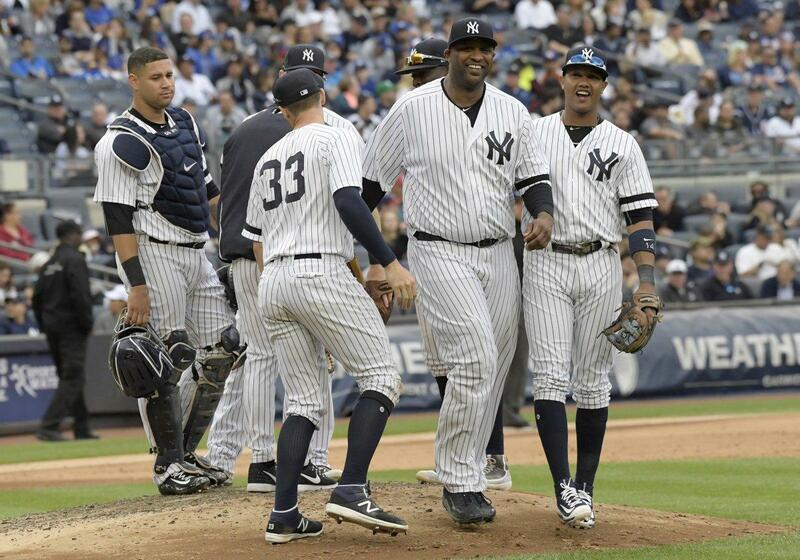 The shutout remained intact much to the delight of Sabathia. Sabathia finished with 5 2/3 innings pitched, and giving up only four hits with no runs or walks. He struck out six in what may have been his final Yankees regular season start. Tommy Kahnle took over for Green in the top of the 8th and unfortunately gave his best impersonation of Dellin Betances (the bad version). The first batter he faced, Ezequiel Carrera, hit a soft dribbler on the third base side and beat the throw from Kahnle to first. Miguel Montero, pinch-hitting for Rob Refsnyder, drew a walk so the Blue Jays had the tying run on base. Kahnle was pulled and replaced with David Robertson. Ryan Goins struck out but D-Rob missed with a full count fastball to walk Teoscar Hernandez. The bases were loaded with only one out. Josh Donaldson hit a fly to left for the second out, with Carrera coming home to score on the sacrifice. Brett Gardner had to run to make the catch as the wind pulled it back, and his throw to the plate almost nailed Carrera but Gary Sanchez couldn’t hold on to the ball. Robertson came through big when he struck out Justin Smoak swinging to preserve the Yankee lead by the slim one-run margin. Aroldis Chapman on the for the 9th inning and it was 1-2-3 game over with Starlin Castro running to his left to catch Darwin Barney’s line drive for the final out. The Yankees win! The Yankees (91-70) saw their hopes for the AL East title dashed in the clubhouse when the Boston Red Sox completed their 6-3 victory over the Houston Astros. David Price got the Sox out of a bases-loaded jam in the 7th inning. Former Yankee Brian McCann did his part with a homer in the 9th inning but it wasn’t enough. The Yankees will host the AL Wild Card Game against the Minnesota Twins on Tuesday night. The winner will advance to play the Cleveland Indians in the ALDS. The Red Sox will continue their current series with the Houston Astros in their ALDS matchup, moving from Boston to Houston for Game 1. 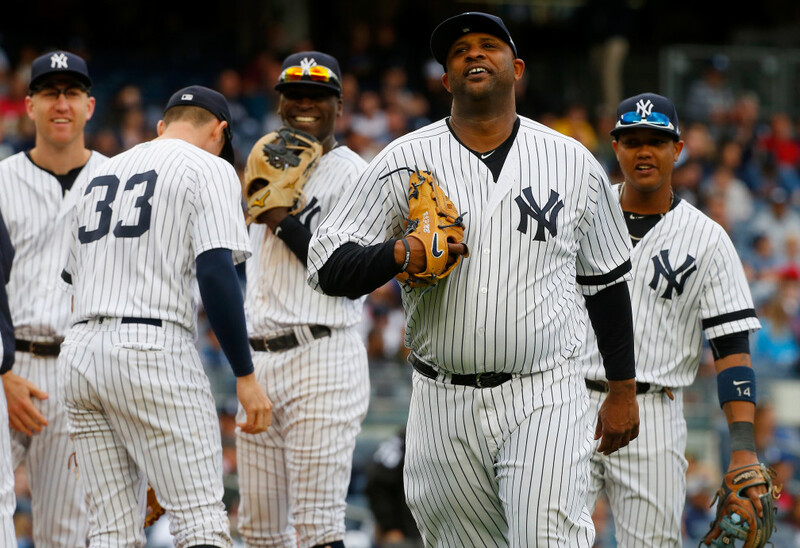 Congratulations to CC Sabathia (14-5) for his successful season. I know that I had given up hope for the aging pitcher, like many fans, but he showed that he is capable of reinventing himself ala Andy Pettitte. 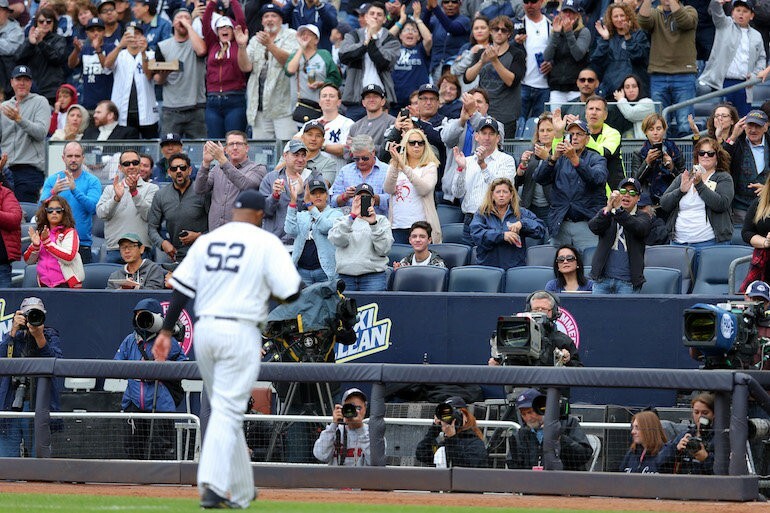 The win was Sabathia’s 237th of his career, passing the legendary Whitey Ford. The troublesome knee is still a concern but CC Sabathia earned his right to be part of the 2018 Yankees. Hopefully, the team and the player can come together for a mutually rewarding contract in the off-season. Aaron Judge will most likely not play today so if that’s the case, he finishes with a .284 batting average, 52 home runs and 114 RBI’s. 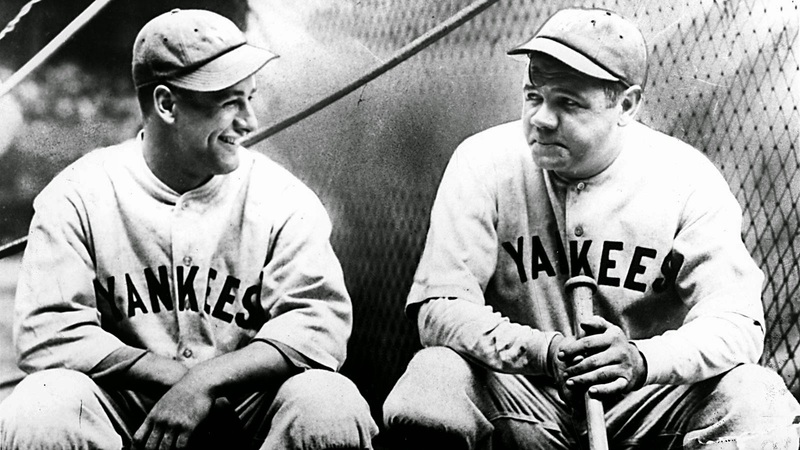 His homer was the 33rd of the year at home, breaking the franchise record set by none other than the immortal George Herman “Babe” Ruth in 1921. It’s been an incredible season for the highly talented young slugger. First full season and he’s rubbing shoulders with the greatest of the greats in franchise history. Andrew Romine of the Detroit Tigers became the fifth player to play all nine positions in a Major League game. To play catcher, he used a ‘hand me down’ glove courtesy of his brother Austin. Romine pitched in the bottom of the 8th inning with the Tigers nursing a 3-2 lead over the Minnesota Twins. He retired the only batter he faced, Miguel Sano, on a ground out to third. He handled all of his defensive chances cleanly. A very nice accomplishment for Austin’s older brother. There was a nice Twitter exchange between Aaron Judge and Marcus Stroman after yesterday’s game. Stroman: @TheJudge44 is creating history. He hits baseballs extremely far too. Lol looking forward to competing against him the rest of my career! Stroman: Always my man. The future battles will be legendary. Good luck in the playoffs young king! Have a great Sunday! The final game of the regular season. Let’s bring home a victory in preparation for Tuesday. Go Yankees! I get that $200 million is a lot of money, and the Yankees have been the only team to play in that neighborhood “salary-wise” until the Los Angeles Dodgers joined the party. But I am surprised to hear Managing General Partner Hal Steinbrenner making comments about the disbelief in fan reaction to the team’s non-activity outside of re-signing its key free agents. Yes, that point is huge. Re-signing Huroki Kuroda, Ichiro Suzuki and Andy Pettitte were essential to the team’s hopes for 2013 so I do not dispute the importance of the team taking care of those players. While I like the signings of 3B Kevin Youkilis and DH Travis Hafner, there are huge injury risks prevalent with both players. I could be wrong but I doubt either player gives the Yankees at least 140 games this year. My point and frustration with the Yankees ownership is the loss of free agents catcher Russell Martin to the Pittsburgh Pirates and right fielder Nick Swisher to the Cleveland Indians. Catching is left to a couple of career back-ups, including one recently associated with PED rumors, unless touted prospect Austin Romine can step it up and make his presence felt in the Bronx sooner rather than later. In right field, the Yankees do have Ichiro but he’s not getting any younger. He certainly won’t provide the pop that Swisher could. He’ll make more happen on the base paths, but isn’t that what Brett Gardner is for? Sometimes, a team needs to make a move to excite the fan base. I do not equate that to throwing money away to satisfy the fans, but making calculated, smart moves that give the team something to build upon. As it stands, the possibility the Yankees lose Robinson Cano to free agency is high. Yes, ownership makes the comments about how they want him to be a Yankee for life. However, I seriously doubt the organization is going to give an 8 to 10 year deal to a 30-year old veteran player even if he is the team’s best player. We have A-Rod to thank for making ownership a bit gun shy, and rightfully so. I think the single biggest detriment to keeping the Yankees from winning the World Series in the next few years is A-Rod. If you could take those dollars and invest them in better, cheaper resources, the team would be much stronger and the goal of coming in under $189 million next year would be possible. The argument can be made that every team in the AL East has the ability to play better than .500 ball, and all have the wherewithal to win the division outright. My guess, at this point, is the division goes to the Toronto Blue Jays, leaving the Yanks, Red Sox, Orioles and Rays to fight it out for a Wild Card spot. But it’s a long season, and there is always the potential the Yankees do make the necessary moves to ensure a strong chance for October success. I saw a report this morning that former Yankees first baseman Jason Giambi has signed a $750,000 minor league deal and invitation to training camp with the Cleveland Indians. It seems a bit strange to see Giambi on a team managed by Terry Francona, but if used in the right way, Giambi could help the Indians. As the Toby Keith song goes, “I ain’t as good as I once was, but I’m as good once as I ever was”. While I think Giambi should have retired, I am sure that he’ll begin his coaching career soon enough and it’s not a bad idea to learn a trick or two from one of the better managers in baseball. Although the Yankees active roster on MLB.com has not been updated, it looks like Kevin Youkilis is going to wear #36. I would have preferred to see the team dust off Jorge Posada’s #20 given that was Youk’s number in Boston. I am not trying to be disrespectful to Jorge, but I’ve never been a big fan of retired numbers unless the guy was an absolute legend like Babe Ruth or Lou Gehrig. Posada had a great career, but I simply do not put him in the same category with catching greats Bill Dickey, Yogi Berra or Thurman Munson. 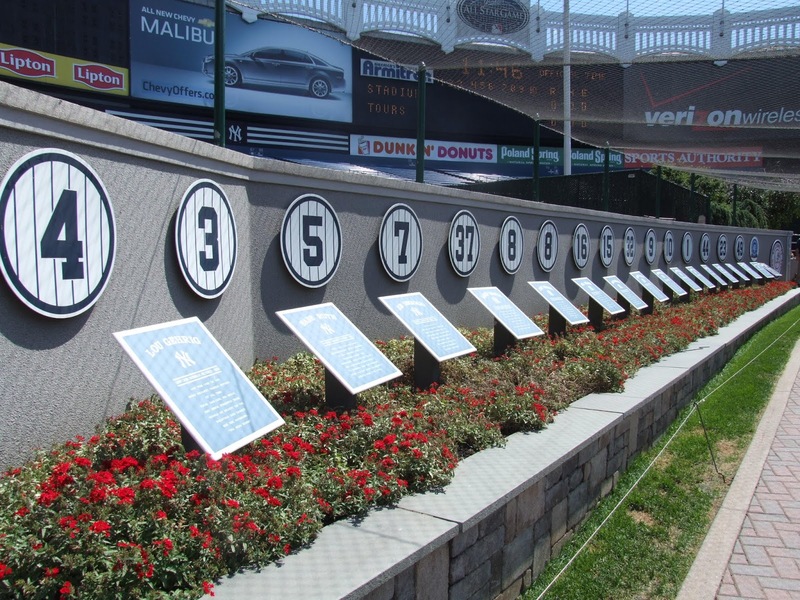 With all the retired and reserved Yankee numbers, it is inevitable that many players will be joining Phil Hughes and Joba Chamberlain in the 60’s or higher. With all the snow Boston has received this weekend, it’s hard to believe that baseball training camps start to open this week. It feels much more like baseball weather where I sit in California as temps are expected to reach the 70’s this week, but for my friends in Boston, I am hoping all are safe and warm. It was a good thing that Truck Day happened before the weather emergency. Even as a Yankees fan, I would never wish ill will on the Red Sox or their fans. As they say, you have to beat the best to be the best and I wouldn’t want it to be any other way. Admittedly, I keep hoping the Yankees announce the acquisition of a proven slugger for right field, but the realist in me knows that the Yankees are truly serious about getting salaries beneath $189 million by next year. I’ve also come to realize that whenever the Yankees are publicly attached to a certain player through rumors or expressed interest, those deals rarely come to fruition. Such was the case with Washington Nationals first baseman/outfielder Michael Morse who was subsequently dealt to the Seattle Mariners. I thought Morse would have been a good replacement for the departed Nick Swisher, but the Yankees obviously felt the cost in terms of prospects was too much. Of the remaining options, there’s always the chance that GM Brian Cashman can parlay his good relationship with Arizona Diamondbacks GM Kevin Towers into a deal for outfielder Justin Upton. I am really not enamored with other possibilities like Vernon Wells. Before I write these next words, please know that I am not a fan of Alex Rodriguez. Therefore, my words about him will always be jaded. My personal opinion is that A-Rod was as immersed into PED’s as the newly admitted doper Lance Armstrong. I look forward to the day when A-Rod no longer wears the pinstripes. When the reports about A-Rod’s ailing hip came to light, there were comments by his doctor that it was directly attributable to his poor play late last season. But today, the news headline is that the cartilage damage was “less than expected”. So, of course, my immediate thought was maybe the hip had nothing to do with A-Rod’s performance…he just tanked it as he always does in pressure situations. The man who lives for his own personal stats is not a friend of mine and certainly not someone I want on my team. I am very pleased to see Jorge Posada accepting an invitation to spring training as a guest instructor. There’s no doubt his exit from the Yankees could have been handled much better, but it is time to make amends and to embrace Jorge as a Yankees Legend. Without question, the uncertainty of the 2013 starting catcher is a great opportunity for Jorge to mentor the right candidate for the job. I think the starter will be Francisco Cervelli or Cervelli in a platoon with another catcher. As much as I like Austin Romine, it’s just not quite his time yet. Welcome back to the fold, Jorge! Hip-hip, Jorge! I know that Andy Pettitte has not committed to the WBC or Team USA yet, but I really hope that it does not happen. I am not convinced that the Yankees can get an entire season out of Pettitte who missed part of last year due to injury. I do feel that 2013 most likely will be Andy’s last season so I hope that we can get the best possible Andy for his swan song. After seeing all those photos of “fat” Derek a month or so ago, it’s clear from current photos that he’s in pristine condition and ready to take the field. 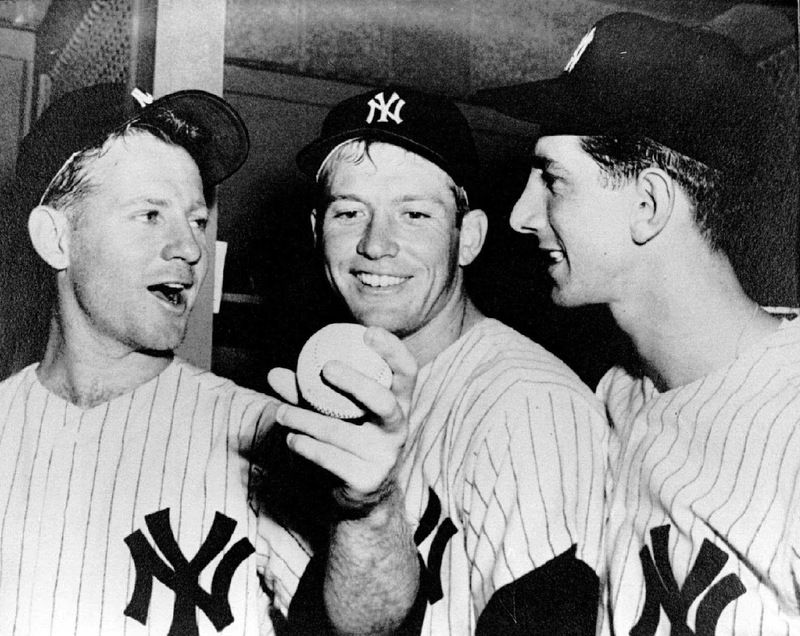 Derek has never been my favorite player (sorry, but Mariano Rivera has held that position since 1996), but he’s a future Hall of Famer and his number will be between Billy Martin and Babe Ruth in Monument Park after his playing days are over. Derek has impressed me with many things over the years but his renaissance after talk he was declining shows how truly special the player is. I have trust in DJ to know that when his time comes, he will walk away. He will never be a burden to the Yankees roster…unlike his teammate to his right. It’s a new year but the new fiscally-responsible Yankees are still in late-2012’s penny-pinching mode and all remains quiet at River and 161st. The latest move is the waiver pickup of utility man Russ Canzler who can play the corners and some outfield. By all accounts, he is less talented than the guy he replaced on the 40-man roster (outfielder Chris Dickerson) but a better fit overall. I only hope the Yankees are able to flip Dickerson, who was DFA’d, for a decent prospect. There’s no doubt the Yankees need good depth behind third baseman Kevin Youkilis who has not exactly been the pillar of health in recent years. At this point, I would be really surprised to see the Yankees make any bold moves. It appears they are willing to go to spring training to see what shakes out. A few years ago, when Mark Teixeira left the Los Angeles Angels via free agency, the Angels’ farm system produced Kendrys Morales as a very capable replacement. When Morales went down to a season-ending injury a year or so later, Mark Trumbo stepped up. Of course, the Yankees do not have that type of depth in the farm system, particularly at first base, but there’s always the possibility that someone somewhere unexpectedly takes it to the next level. Clearly, the Yankees would benefit greatly by having a few more cost-controlled young players on the roster. But as far as major league ready prospects go, the Yankees need another year or two as the best talent is still in the lower levels. I guess that means we’ll see more Russ Canzler type moves as GM Brian Cashman tries to capture lightning in a bottle. If the Yankees underperform in 2013, are manager Joe Girardi and/or Cashman at risk for losing their jobs? Or does the team’s current reduced spending posture mean ownership will be more tolerant of losses? It remains to be seen but this is clearly putting Girardi and Cashman in the proverbial hot seats. I am glad to see the NHL has finally resolved its differences with the players and have agreed upon a new collective bargaining agreement. However, it will be tough, admittedly, to be energized about a 48- or 50-game season. If your favorite team struggles at the start of the season, it could possibly cost them play-off contention. An entire season would have looked radically different than the upcoming shortened season. Every year, new stars and heroes emerge and I wonder about the guys who could have been that star but now may never get the opportunity. I guess pure talent perseveres, but still, there were far too many sacrifices made for the lockout. I was not optimistic about the Minnesota Vikings’ chances against the Green Bay Packers last weekend, particularly given the game was being held at Lambeau Field. I did not realize that Christian Ponder’s elbow injury threatened his ability to play so Sunday’s announcement that he had been ruled inactive came as a shock. The designated starter, Joe Webb, had not started a NFL game in two years. Say what you will about quality practices and reps, but there’s nothing better than playing the games. So, I did not expect Webb to provide a championship performance. He didn’t, and the 24-10 loss was pretty much as expected. Nevertheless, what a terrific season by the Vikings! At the beginning of the year, the talk was the team would be drafting high in April 2013, perhaps as high as second or third. Yet, the team won 10 games and made the play-offs over the Chicago Bears. Adrian Peterson’s 2,097 rushing yards was an incredible accomplishment. I remember being envious of the Bears when Walter Payton was playing as it was clear he was head and shoulders above everyone else. But the Vikings have that guy in Peterson. It was a special season to build upon and hopefully it will propel the Vikings to legitimate contender status in 2013. Although there have not been any official explanations for the DH plans this upcoming season, there’s been reports that the Yankees are content with a rotation to include Alex Rodriguez, Andruw Jones and Derek Jeter, with Eduardo Nunez sliding around the infield filling the holes. My concern last season and it gave me a bad feeling heading into the play-offs that the Yankees had missed the clutch bats they enjoyed when Johnny Damon and Hideki Matsui were on the roster. Damon’s home run in the 2004 ALCS helped propel the Boston Red Sox to a comeback victory over the Yankees, and propelled the Sox to their first World Championship since the days of Babe Ruth. I’ve heard minor league slugger Jorge Vazquez mentioned as a possibility, but I am with those who believe that he skills do not translate to the major league level. In my opinion, the Yankees need to do something. I am not looking for a $10 million slugger who would command 90% to 95% of the DH at-bats. I am content with someone who could take the majority of the at-bats, allowing for the A-Rod/Jeter rotation, and would know and accept their role. That’s why I feel that either Johnny Damon or Hideki Matsui would make complete sense. I know the Yankees want to limit their payroll at this point and I get that. But if the difference in making the World Series or not was an additional $5 million, would it not be worth it? Yeah, yeah, it’s not my money and $5 million is a lot of money. But when you are spending $210 million, what’s $215 million? Wouldn’t the return on a championship more than replenish the difference? The Yankees have options and I know that’s why they are not in a rush. I’ve even heard Raul Ibanez’ name mentioned and would agree that he would be a viable option. I guess I have greater affection for guys who have proven they can win in pinstripes. It’s funny but the Philadelphia Phillies look like geniuses for signing Jim Thome early in the off-season. At the time, it looked like a bad fit. Maybe he stays with the Phillies, but they could actually move him for something at this point given the DH desperation that exists for a number of teams besides the Yankees (like the Detroit Tigers, for example). If GM Ruben Amaro could somehow swing Thome for a decent prospect, he’d build upon his legacy as a great general manager. Congratulations to Jamie Moyer for his minor league contract with an invitation to spring training with the Colorado Rockies. I was really surprised when I heard that Moyer intended to make a comeback following his recovery. At 49, the odds are probably against him, but you have to love his no-quit mentality. Similar congratulations go to reliever Joel Zumaya, who signed with a quality organization (the Minnesota Twins). Ironically, it was at Target Field where Zumaya’s elbow exploded a couple of years ago. I remember when he was hailed as THE flamethrower in the league, and was a huge part of the Detroit Tigers bullpen. It’s anybody’s guess what kind of pitcher he will be going forward, but it would be good to see him recapture success for an organization that deserves better than last year’s 99 losses. 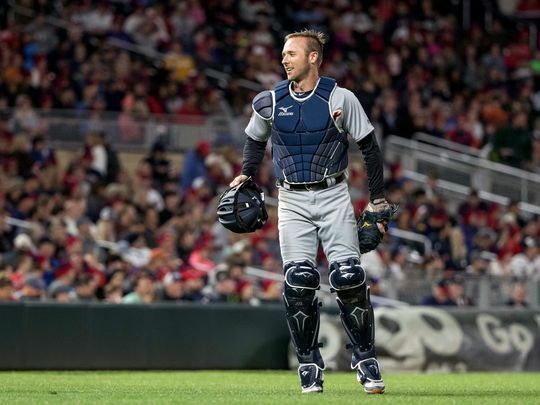 With the departure of Joe Nathan and the inconsistency of Matt Capps, there’s certainly going to be opportunity with the closing and set up roles for the Twins. Back to the Yankees, I’ve wondered if some kind of deal involving the Chicago Cubs would work. The Yankees want to unload A.J. Burnett, and he’d clearly benefit from a change of scenery. He’d also be more effective in the National League at this point. I wouldn’t say that the pressure would be less in Chicago, but I think A.J. could more himself. Conversely, the Cubs have an albatross with Alfonso Soriano. Soriano could still be a fairly productive DH at this point in his career. Not that I want to give two rosters spots to over-paid, under-productive Sorianos but it would be a potential solution. I think I can speak for most Yankees fan when I say that we’ve rode the Burnett train about as far as we care to. Now that Michael Pineda and Hiroki Kuroda have all but pushed Burnett out of the rotation, a win-win trade with the Cubs would certainly make sense. If I’m Cole Hamels, I am going for free agency in the fall of 2012. Don’t even talk to me about an extension! If the Texas Rangers will lay out $110 million for an unproven, albeit very highly talented, pitcher, there’s no question what a championship performer like Hamels can command on the open market. As for the ongoing Prince Fielder sweepstakes, I just wish the Washington Nationals would put one of those ridiculous Jayson Werth type contracts in front of him and get him signed. I’d be surprised if the Texas Rangers were financially able to sign both Yu Darvish and Fielder but stranger things have happened. I really don’t want to see Fielder in for Mitch Moreland on the defending AL Champions. I still think the Los Angeles Angels, thanks to Albert Pujols and C.J. Wilson, are a better team in the AL West, with or without Fielder on the Rangers, but I certainly do not want the potential roadblocks to a Yankees World Series getting stronger. First base at Yankee Stadium will forever mean Lou Gehrig to me until the day I die, even if I didn’t personally get to see him play. For what I have seen, Don Mattingly is the epitome of greatness. I was a bit skeptical when Tino Martinez took over for Mattingly, but he played the position as well as anyone could have following the footprints of #23. I loved the signing of Mark Teixeira and he was a prime reason for the Yankees success in 2009, but after a couple of disappointing seasons with the usual stone cold starts, something has to give. Defense alone at first base is not enough. Not that I want to go back to the days of Giambi (great bat, not-so-great glove), but Tex needs to dedicate himself to an improved performance in 2012. I know that we’ll have to deal with the usual sluggish start, but he needs to show that he can be more like the 2009 Teixeira than the 2011 version.